Join us for the screening of short films focused on America’s prescription drug/opioid addiction and overdose death epidemic. A panel discussion and Q&A session with youth, producers and cast members of our featured short films will immediately follow the screening. Prescription drug and illegal opioid abuse has become a national epidemic and our local communities are feeling the impact. Education is empowering and key to turning this health crisis around. You’ll learn what action YOU can take to protect those you care about from developing a substance use disorder or from succumbing to an accidental drug overdose. 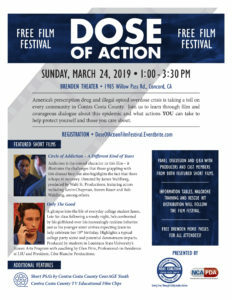 Lifesaving free Naloxone Training and Overdose Rescue Kit distribution following film screening plus, free Brenden Theater movie passes for all attendees.